MegaDownloader is the ultimate solution for people who are expecting a dedicated Mega.nz download manager. The latest version of MegaDownloader 1.7 has exceptional features. Which makes it one of a kind download manager. You can pause, resume, download or even stop the downloads at any time and the good news is it’s Free!! Mega.nz links are known for their download speeds and downloading via MegaDownloader is no exception. Whatever your Internet speed is, it can handle. Which helps them force users to upgrade to their paid tiers. Whereas MegaDownloader is unofficial, Free, Fast, Stable & Light which comes with lots of advantages. 3 Is MegaDowloader safe to use? 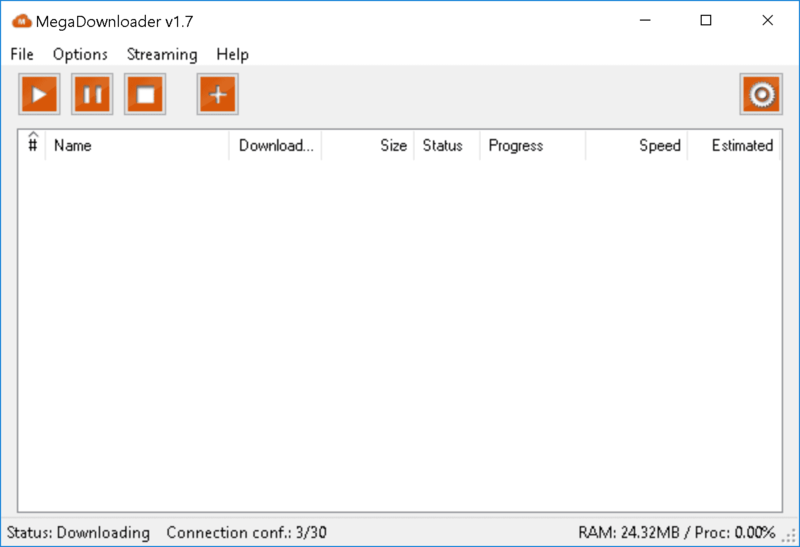 Multiple connections to the downloads in the downloads queue like a torrent client and the processor usage are simple yet powerful features that are equipped on to the app. Bandwidth restrictions and download limits per user and mostly free user can be handled with this app. Despite the limit, Mega Downloader lets you download at full speed without any barriers to slow the downloads. The best example would be ” Internet Download Manager “, yes you can download them using IDM from the link generated in the streaming options. Once you downloaded the app from the download link mentioned above. Install it on your PC like any other software. Now copy the Mega.NZ desired download link and open the Installed Mega Downloader. It automatically detects clipboard copied links and prompts you to start the download. Proceed with that and you’re done. Full speed download without any restrictions. for links that are separated from the download key is not detected by Mega Downloader and can’t be used for downloading in the software. So make sure the link is a combination of both the key and the URL. No option to enter download key, yet. Is MegaDowloader safe to use? Absolutely, it’s very safe to use. Many people get this question when opting to download files some an online service that too using a third party downloader. First of all, You can clearly observe each and every URL you use on the downloader which is prefixed with an HTTPS. So Mega use SSL means 128bit encryption to the files. You might argue on this like this is for the people who upload files and doesn’t work the other way. You’re wrong, this applies the other way too. When using MegaDownloader, the files that are being pulled from the same encrypted server. And, there won’t be any manipulation between the session. Most people trust IDM/Internet Download Manager or any other Downloader. The same way it was built and only dedicate to downloading of Mega.NZ Files. Mega.nz is one of the popular file sharing sites online because of its features. A 50 GB Cloud Storage limit is very attractive and very few sites offer such limit on a free account. That’s why many prefer to use it and lead to the development of such download manager to ease the process and even advance the usage with some extra tweaks. Stay tuned for more tutorials and guides helping you to use the software up to its full extent and share the website if you find useful. More articles are coming very soon on the website.